Beer crawls are alive and well, but another mobile experience has been gaining in popularity in recent years. “Beer Trails” are the new darling of the beer tourism movement, and in my opinion, more fun to navigate than a crawl. Unlike a bar crawl, a beer trail won’t take you from bar to bar but brewery to brewery, with possible craft brewpubs scattered in between. Yes, this means you’re traveling a lot farther between stops, and you’ll probably have to secure a designated driver and shower him/her with delicious gifts, including a collection of tasty beers from the breweries you visit. One such trail that all St. Louis area beer lovers need to experience is the Southern Illinois Beer Trail, and they have an event coming up that is a perfect introduction to the breweries that are located on it. 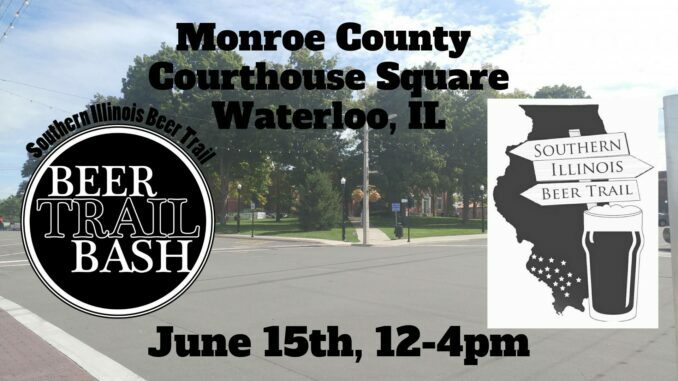 The 2nd annual Beer Trail Bash Festival features 17 breweries and distilleries and takes place on June 15th, 2019. The festival will begin at the Monroe County Courthouse Square in Waterloo, IL. Waterloo is located about 25 minutes south of St. Louis. The game plan is to have the annual festival at a different loop on the trail each year. Waterloo is home to Hopskeller Brewing Co. and Stubborn German Brewing Co., and the Courthouse Square between them is the perfect outdoor arena for the festival! Tickets are only $30 and can be purchased in advance via Brown Paper Tickets. Tickets include tastings, music, the chance to “meet the brewers,” a commemorative glass, and fun! Tickets are $35 the day of the festival (cash only the day of the festival). Designated driver tickets are $5 in advance and $10 the day of the festival. What is the Southern Illinois Beer Trail? The not-for-profit entity Southern Illinois Beer Trail consists of 17 breweries ranging from Alton to Cobden and even features one distillery. The trail is broken into three loops. Red, blue and green.